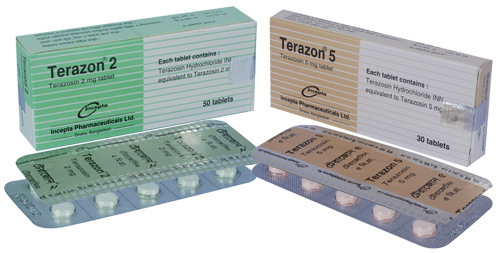 Terazon 2: Each tablet contains Terazosin hydrochloride INN equivalent to Terazosin 2 mg.
Terazon 5: Each tablet contains Terazosin hydrochloride INN equivalent to Terazosin 5 mg.
Terazon (Terazosin hydrochloride) is a selective alpha-1 adrenoreceptor competitive blocking agent with a longer duration of action. Terazosin is a quinazoline derivative. It is very rapidly absorbed and performed activity within 15 minutes after oral ingestion. Initial dose: 1 mg at bedtime is starting dose of all patients and this dose should not be exceeded. Subsequent dose: The dose slowly increases to achieve the desired response. The usual recommended dose range is 5-10 mg administered once a day. Subsequent dose: The dose slowly increases to achieve the desired response. The usual recommended dose range is 2-10 mg administered once a day. Postural hypertension is more commonly reported side effect. Dizziness, lack of energy, peripheral oedema; urinary frequency and priapism reported. First dose may cause hypotension (within 30-90 minutes). Therefore should be taken on retiring to bed. Caution should be observed when Terazosin is administered with other antihypertensive agents; avoid the possibility of significant hypotension. When adding Terazosin to a diuretic or other antihypertensive agent, dosage reduction and retitration may be necessary. The patients should be cautioned to avoid situation such as driving and hazardous tasks where injury could result due to syncope after initiation of Terazon therapy. The safety of Terazosin during pregnancy has not been established so Terazosin is not recommended during pregnancy unless the potential benefit justifies the potential risk to moher and fetus. It is not known whether Terazosin is excreted in breast milk. Because many drugs are excreted in breast milk, caution should be exercised when Terazosn is administered to a nursing mother.